Lowest Prices for the best trailer bearings races seals caps from etrailer. 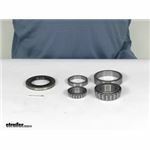 Bearing Kit, LM67048/25580 Bearings, 10-36 Seal part number BK3-300 can be ordered online at etrailer.com or call 800-298-8924 for expert service. Outer Bearing Inner Bearing Seal Seal I.D. Today, we're going to take a look at the bearing kit for 5,200 pound axles. This kit includes everything shown here on the table. It includes the inner bearing and the race, includes the outer bearing and the race, includes the double lip grease seal, and a cotter pin. Now, the bearings they use in this kit is a high quality tapered roller bearing designed for high speed use. The grease seal is a double lip grease seal, which will retain the grease inside the hub better and will give you better protection against moisture and road grind than your single lip seals. Now, I want to go over the part numbers and the measurements on these, just to note so you'll know what you're getting. The inner bearing, which is the larger of the two, is part number 25580, which is stamped on the bearing itself, has an inside diameter of 1.75 inches. The inner bearing race, which again is stamped on it 25520, has an outer diameter of 3.265. You can see how they go together, just like that. Now, the outer bearing, which is part number LM67048, has an inside diameter of 1.25 inches and the outer bearing race, which is part number LM67010, has an outside diameter of 2.328 inches. Again, you'll see how they fit, just like that. Now, the double lip grease seal and it's stamped on here is the part number GS-2250L, has an inside diameter of 2.25 inches, an outside diameter of 3.376 inches. Then the cotter pin, which is used for standard spindle applications when you install it. That should do it for the review on the bearing kit for the 5,200 pound axles. The grease seals that will work with your Lippert axle is part # RG06-070. this comes with a quantity of 2 double-lipped seals in the package. If you have everything apart you may want to replace the bearings and races as well. You would need part # BK3-300. This includes the inner and outer bearing, a grease seal, and the inner and outer races as well as a cotter pin. This kit is what you need for one wheel so if you are rebuilding all four then you can change the quantity when ordering. We have one hub that matches the criteria you mentioned. It is part # T1721400042. It has bearings with inner diameters of .75 and 1.25 inches plus has a bolt pattern of 5 on 4-1/2 inch. For your Lippert 5,200 lb axle the correct bearing kit you need is the part # BK3-300 which fits the "number 42" spindle your trailer has. Actually the bearing info you listed indicates you have a very standard number 42 spindle which we have plenty of fits for. Only issue is that you'd need to go with a 6 on 5-1/2 bolt pattern. So for that you'd want the part # 8-201-5 with the bearing kit # BK3-300 and grease cap # RG04-060. Then for brake assemblies part # AKEBRK-7-SA which is a kit for both sides of the axle. 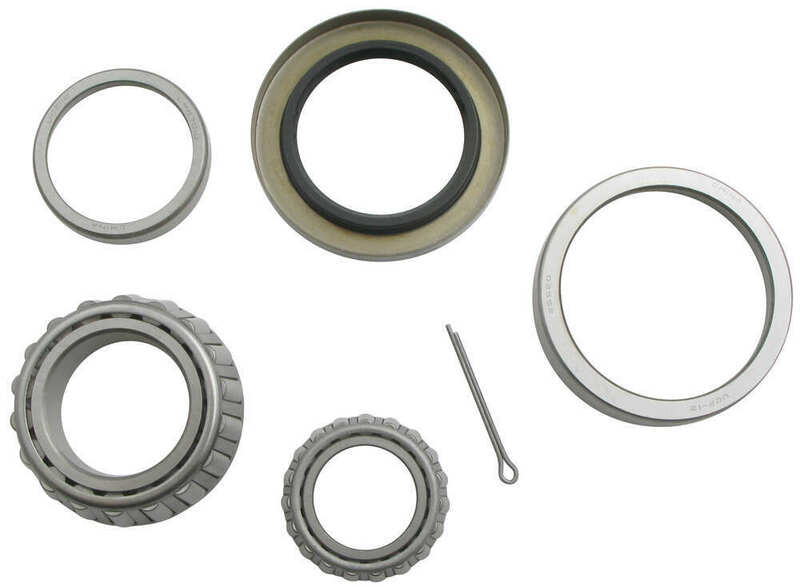 The complete bearing kit that includes # 25580 for the inner bearing and # LM67048 for the outer bearing is # BK3-300. The kit includes the bearings, seal, a cotter pin, and the races. Assuming that your hubs use the LM67048 outer and 25580 inner bearings, you will need the # BK3-300 which uses the 10-36 double lip grease seal with a 2.25 inch inside diameter. The BK3-310 uses a seal with a 2.125 inch inside diameter, which would not be compatible with your spindle. If you wish, you can confirm this by using a digital caliper like # PTW80157 to measure the diameter of the spindle surface where the spindle rides, as shown in the diagram. The seal that is included with bearing kit # BK3-300 has an inner diameter of 2.25 inches and outer diameter of 3.376 inches which matches the info you have found. This kit also includes inner bearing 25580 and outer bearing LM67048 so if your outer bearing is the same this is the right kit for you. If your outer bearing is 14125A then you would need kit # BK3-200.